Beautiful, healthy teeth and good overall oral health will allow you to smile with confidence and enhance your self-image. At smile2o we work closely with each of our patients to establish and maintain overall oral health. Our patients are the only form of advertising that we do – another good reason for doing our best to make you look and feel your best! 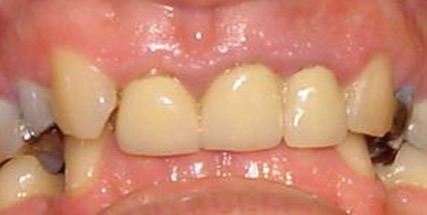 This young lady had no confidence in her smile and was extremely unhappy with the appearance of her upper front teeth. When she was referred to our specialist centre, orthodontic treatment was already being carried out by one of our colleagues at another dental practice. Our lead clinical specialist, Dr. Wayne Williams examined and consulted with the patient and explained the cause of the problem. We also discussed the various options for long-term restorative-cosmetic treatment with the patient and agreed what would be best for her. 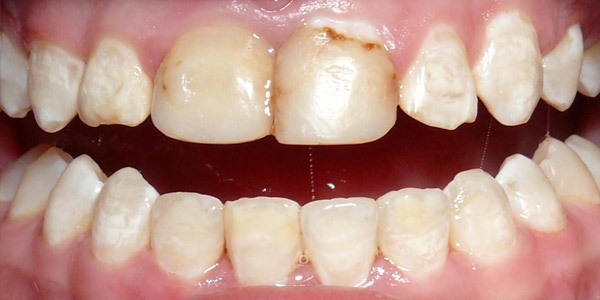 Fluorosis (Fluoride Staining) can occur from over exposure to fluoride while the teeth are still developing. To help restore her self-confidence by improving her dental appearance we agreed to place Porcelain Veneers on her two central incisor teeth and to build-up the two lateral incisor teeth using highly aesthetic composite materials. The patient was very pleased with her new smile and has subsequently let us know how much this has helped in restoring her self-confidence. This patient didn’t like the colour of her teeth. 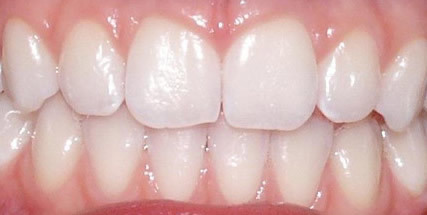 The naturally darker shade and external staining of her teeth had caused her to become self-conscious of her appearance and she felt that her smile could be “fresher”. As a young adult, we felt that it was important to help her achieve a smile that she could be proud of and confident with. After discussing her concerns with Dr Williams and exploring the various options to achieve the outcome she wanted, it was decided that a home-application Tooth Whitening treatment would be best to achieve this. 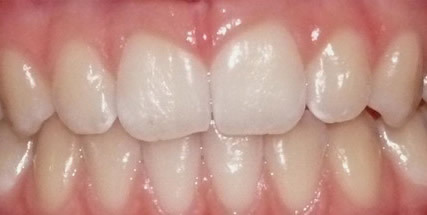 Impressions were taken and customised whitening trays manufactured. 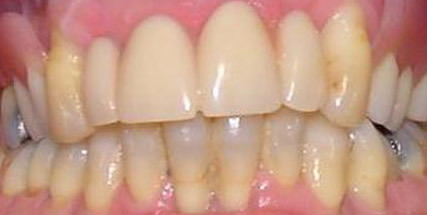 Safe application of the whitening gels took place for 8-days (2-hours per day). This technique allows you to control the application of the treatment and the degree of shade change, in the comfort of your home. Because the application of the whitening gel is gradual, it is safe to use and the effect will last longer. We are all very pleased with the treatment outcome and every time we see the patient she seems to be smiling even wider. 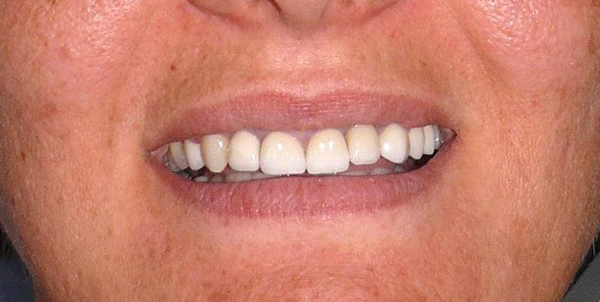 This lady had porcelain veneers placed some years before and felt that we could assist her in further improving her lovely smile. She specifically wanted to retain the “natural appearance” of her teeth and the final shade of the new veneers was selected accordingly. The restored shapes of the upper four front teeth were carefully sculpted to best suite her facial profile and lip line. 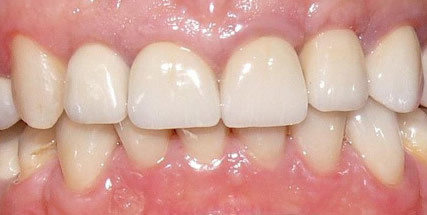 Finish lines for the veneers were carefully planned, allowing for a seamless integration of the restorations with the supporting teeth and the gum line. Attention to detail in the preparation and manufacture of all our restorations, allows us to provide natural shapes, texture and tooth shades for all our patients. Another happy and confident patient in our smile2o family. 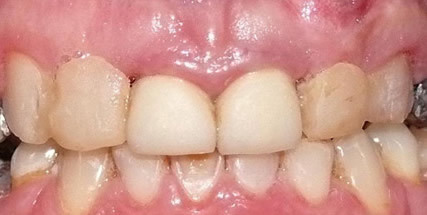 For many years this patient suffered from severe Periodontal (gum) Disease. 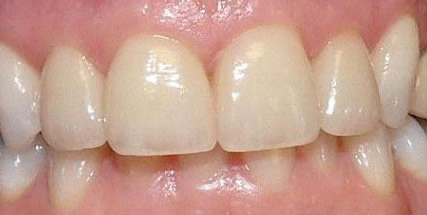 As a smoker she was more exposed to the adverse effects of this disease, resulting in tooth loss. 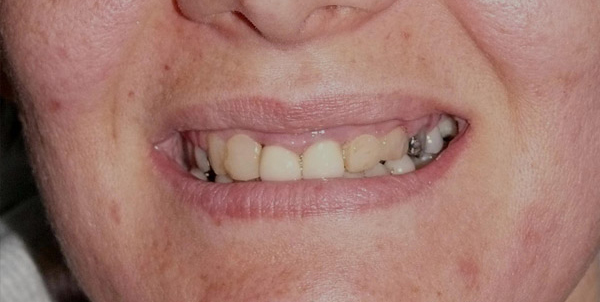 To help restore her oral and dental health and to provide the naturally attractive smile she wanted, we placed dental implants in the upper and lower jaws and restored the teeth with a combination of fixed and removable bridges. Television programs have recently popularised the “Extreme Smile Makeover” and this case demonstrates why. Not only were we able to assist this lady in restoring her oral and dental health, but the dental treatment has also provided for the required support of her facial soft tissue (cheeks and lips) that further enhances her youthful appearance. Good oral function, through effective chewing has also been re-established and this will allow the patient to enjoy good food and good wines for many years to come. Treatment success at the 6-year follow-up has been recorded as 100%, with all the implants and bridges fully functional and healthy. The patient is very pleased with the enhanced health and appearance that her dental treatment at smile2o has already provided and continues to provide for her. This patient was referred to us with severely compromised oral and dental health, despite having had a vast amount of dental treatment. 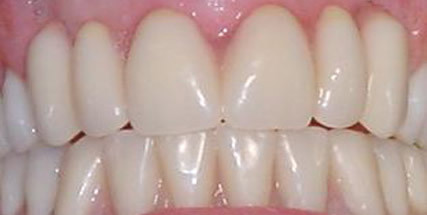 Ideal treatment would require the combined skills of various specialists within our dental team. 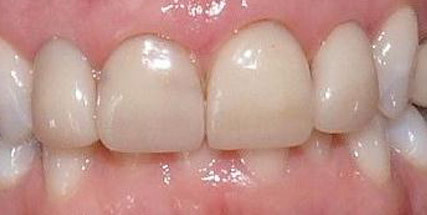 The final treatment plan was to provide a complete reconstruction of the front upper and lower teeth. Thorough planning was conducted and the first stage corrective jaw surgery completed by an Oral-Maxillo-Facial Surgeon. 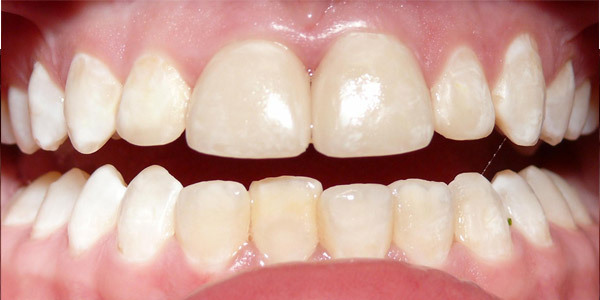 Orthodontic correction (fixed braces) was completed, followed by restoration of the teeth and smile using dental implants, crowns and porcelain veneers. Ongoing care and maintenance is very important, especially where complex treatment has been carried out successfully. This patient is delighted with her restored dental health, improved function and beautiful smile and the only regret (that we share with her) is that she had not attended for specialist treatment and care at smile2o long before.